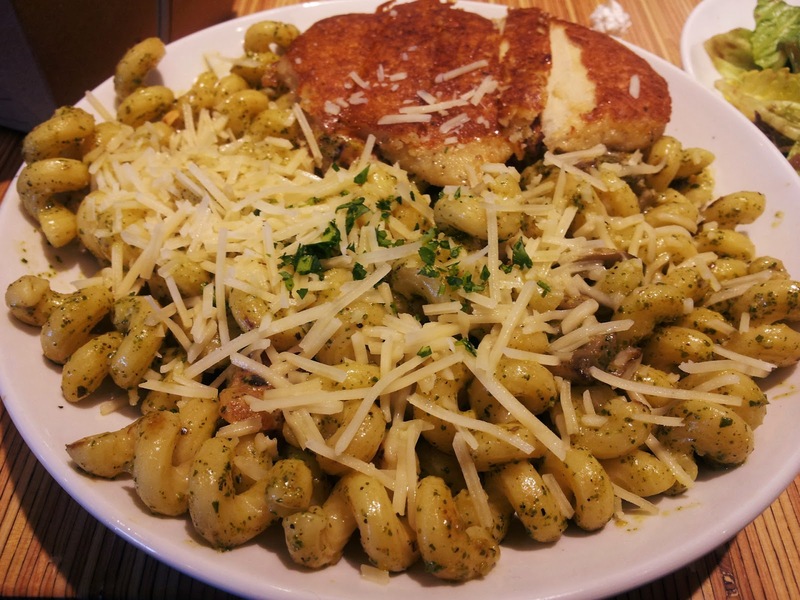 Ah, Noodles & Company. I'd driven by them so many times around Oregon, but with so many options available, there was always something I wanted more. So, I was understandably excited when I found out they were coming to Meridian (and later Boise). I signed up on their mailing list, paid attention to the construction progress whenever I drove by, and reviewed the menu so I'd know what to order when I finally got the chance. For our first visit, the roommate and I decided to go WAY overboard. Fully anticipating having leftovers for lunch the next day, I got a large order of Japanese Pan Noodles, following the menu's advice to add marinated steak. And because I can't resist dumplings, I tacked on an a small order of potstickers as an appetizer. My dining companion chose the Penne Rosa, opting to spend the extra money to top it with parmesan-crusted chicken. We also ordered a Spinach & Fresh Fruit Salad to share, and a dessert for each of us: a snickerdoodle for her, and a Rice Krispie Treat (or whatever their version of it is called) for me. We were both very fond of the salad which, in addition to the namesake spinach and fresh fruit (apples), came with pecans, croutons, bleu cheese, bacon crumbles and a lightly-applied balsamic fig dressing. This is definitely one of the best salads I've ever had from a fast food/fast casual place, and it raised our expectations for the rest of the meal. My potstickers were by far the most confusing part of the experience. Bearing none but the most superficial resemblance to anything I understand to be a potsticker, they were flat, limp and mostly flavorless. The soy-based sauce helped a bit, but these were still not something I would ever order again. The roommate liked her dish much more than I did, but still wasn't overly impressed with it. I've never been overly fond of creamy tomato sauces, and the fact that it was mildly spicy just made it that much stranger to me. I was surprised by the chicken, which was sliced surprisingly thin and coated with a crust that was so non-crumbly it was more of a thin shell, but I do have to admit the flavor was pretty decent. The strangest thing about my dish is that I don't remember the steak at all, and while that means it didn't make much of an impression, it's perhaps more important to emphasize that it didn't make a BAD impression either. When you're discussing steak from a place like this, that's a good thing. The vegetables were good, but the standout thing to me was the udon noodles, which had been caramelized in a sweetened soy sauce. The roommate thought they were too dense and chewy, but she had never had udon before. 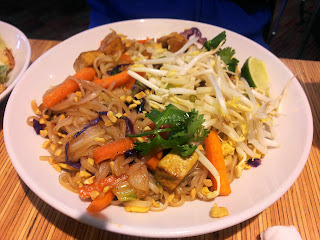 I have, and I was very pleased with how much flavor the sauce added to what is usually a pretty mild noodle. Still, they weren't good enough that I would rush to order them again. I'm now giving up on these puffed rice and marshmallow things. They're one of those odd things that just taste better when they're made at home. The sole exception would be the ones from Archie's Place, but they had so much marshmallow that you can almost feel your teeth screaming in protest about all the sugar (but they are freaking delicious). That said, these are no worse than most of what you find while out and about. This was the second big surprise of the evening. Being kind of cinnamon freaks, the roomie and I both dearly love snickerdoodles, and both of us agreed this might be the best one that either of us has ever bought. It was just a little crisp around the edges, had so much cinnamon that you could see it just by looking, and it was oh so chewy. We've spoken about going back just for these cookies, though we haven't done so yet. All in all a decent meal, enough so at least that I returned a week later to grab lunch. Noodles & Company tends to feature ingredients (asparagus is the current one), and at that time the big thing was their new braised pork, which they used to create a new menu item by combining it with their Wisconsin Mac & Cheese, crunchy fried onions and a drizzle of barbecue sauce. This was another dish that I was really looking forward to but which became another "eh". The pork was good, the barbecue sauce was flavorful even given the small amount used, and the crispy fried onions were indeed crispy and oniony, but the mac & cheese itself left something to be desired. Speaking plainly, it was bland and a little on the wet side. The chocolate chip cookie, while decent, simply doesn't compare to the snickerdoodle. It was definitely better than the puffed rice thing I ordered on my previous trip, but not by much. My third and most recent trip came as a result of the aforementioned mailing list, when they sent out invites to try the new Boise location before it officially opened. This time I was accompanied by my sister, my sister's beau, and my mother. Sis got the Pad Thai with tofu. She said it was about what she expected: okay. Her boyfriend, as best as I recall, got the Mac & Cheese with pork. I figure it must have been that since I didn't get a picture. His opinion was pretty much the same as mine. 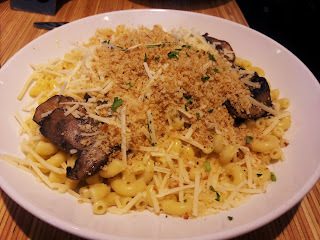 Mom chose the Truffle Mac, which is Noodles & Company's signature dish. They hit their standard Mac & Cheese with white truffle oil, and top it sautéed baby portabellas, parmesan and toasted bread crumbs. This dish didn't engage much enthusiasm either. This time out, I decided to indulge my pesto obsession with the Pesto Cavatappi, which also gave me an excuse to try a new kind of noodle. The pasta was interesting and well-cooked (they seem to do pretty well at that in general), but the pesto didn't have the kind of flavor intensity I like, which seems to be a common theme with pretty much everyone I've talked to. Terms like "okay", "decent" and "pretty good" come up a lot.